What makes a ‘heavy duty’ trampoline? At Vuly, we’re often asked what exactly makes a trampoline heavy duty. Well, not all trampolines are created equal. Some are designed with sturdier frames, to hold higher weights and to endure rough weather; others are not. A heavy duty trampoline can take more weight. Through a combination of a well-designed structure and solidly made components, it is able to rebound much heavier weights than normal trampolines. This is ideal for larger parents or older kids, and means that the legs are less likely to buckle or the mat stretch. Vuly trampolines boast 150 kg weight ratings – among the highest of any trampoline on the market. Unofficially, Thunder Pro can even hold the weight of an entire car! Its closest no-spring competitor can only manage a 80 or 100 kg rating, while most coil spring trampolines can only manage 130 kg. We’ve all seen at least one in a friend’s backyard: the sad, buckled-leg trampoline sitting in disuse. Some trampoline frames simply aren’t designed well enough to prevent collapsing and don’t get the steel treatment that an outdoor product needs. A robust frame is essential for a heavy duty trampoline. 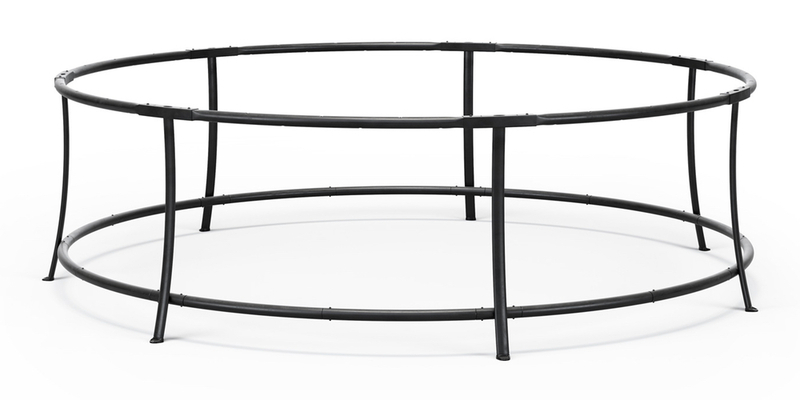 Luckily, all Vuly trampolines use click-together frames that are completely secure and sturdy for the long term. Lift, Lift Pro and Thunder use double-ringed frames for extra strength, and Thunder Pro's rectangular tubing and dense, heavy base offers second-to-none durability. Every one is guaranteed to last for years – 10 years, in fact! The more ‘delicate’ parts of heavy duty trampoline should really be nowhere near fragile. A protective safety enclosure that can also withstand the weather is just as important as a hardy frame. Many cheap safety nets and net poles come apart of collapse in heavy wind, and too many frames aren’t rust resistant. That’s not heavy duty! After all, what good is an outdoor product, if it can’t handle being outdoors? Vuly frames are double galvanised on both the inside of the tubes and on the outside to prevent rust. Thunder Pro and Lift Pro are even powder-coated for extra protection. Their rigid net poles have been tested in the wild Australian weather. In fact, the nets on Thunder and Lift use the most UV-resistant material on the market. Have you seen any other trampolines that stack up and could claim to be ‘heavy duty’? We think that our trampolines are the hardiest out there!